1. Fill out and print the applicable order form. 2. Pack your box of photos, slides, negatives, Video tapes or audio cassette tapes and vinyl records,and include the filled out order form. 3. Post or deliver to us for processing. When posting we recommend you use registered post as a minimum. Or If you live within a 10 minute drive from Caroline Springs Victoria contact us to arrange for free pick and delivery. Please feel free to contact us to advise that you have sent an order through, we will then be aware your precious photos and order is on the way. How To Bundle and stack your Photos. All photos must be supplied to us stacked facing the same way and out of albums (unless using our album removal service) clean and as dust free as possible. Also please try to arrange them in the same direction and in size order. Remove any staples, paper clips and adhesives and any photo shape that is irregular, as these photos cannot be scanned, unless you want them scanned on our flatbed scanner. Please advise us on the order form. If you would like them scanned in specific order and folders/albums please separate them into your required bundles labelled as your preferred folder names. If you would like specific photos scanned front and back please separate and label these as well. 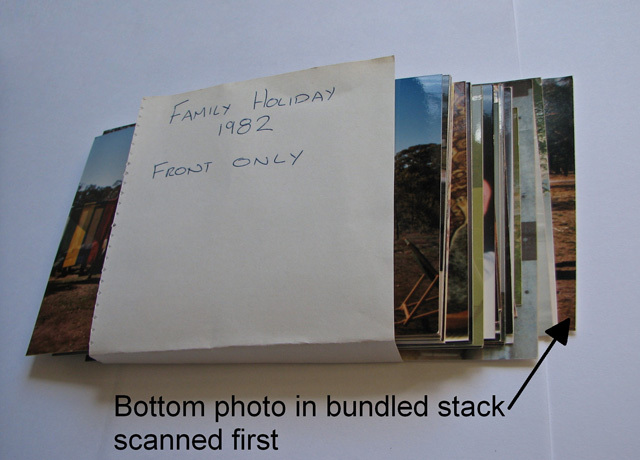 The bottom photo in each bundle is scanned first. If you want the images put onto a USB drive, portable hard drive or memory card you must provide this to us with your photos. Note: If your photos are very old and fragile we recommend you scan them on our flat bed scanner. How to Pack for Posting. Make sure your photos are well packed and padded. Do not to use tissues, tissue paper, newspaper or old torn paper when packing your photos, as this generates paper dust and will cause dust marks on the scans, its best to use bubble wrap. We also suggest photos are wrapped in a plastic bag to keep the moisture out, then packed in a sturdy box or padded bag, which can also be re-used for return postage of your photos, allowing room for the DVD. BC/A5 - Holds 550 Standard 4"x6"photos and allows for a DVD to fit. Packed weight approx 2kg. BM/A4 - Holds 1500 Standard 4"x6"photos and allows for a DVD to fit. Packed weight approx 4kg. We realise how important your photo memories are and strongly recommend you post them to us using registered post, express post or platinum post. It may cost a little bit extra, but this way your parcel can be tracked. Whats next you ask, read on. On arrival of your order we will promptly email you to let you know that it arrived safely, and your order is being processed. After we have finished scanning your photos we will email you with a couple of samples of your scans along with an invoice attached showing the final number of scans and any postage charges. You can pay this invoice by direct bank deposit / transfer, money order, cheque, or cash on pickup and delivery. Further details will be supplied on the invoice. Once we receive your payment we will then return all your original photos along with your scanned photo memories 2 disk by registered post. We shall also send an email to advise you when the order has been dispatched. Try our FAQ page for your answers. If you still require further information please feel free contact us directly.